Welcome to Bible Land Shop's Biblical Cosmetic collection. 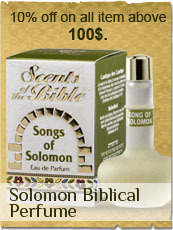 Find here the very best of Jewish and Christian Biblical Cosmetics. Like father like son, Bible Land Shop's Biblical Cosmetics allows you to use the very same Mineral Creams, Body Soaks, Moisturizers, Body Butters, Body Lotions, Body Scrubs, Body Splashes and Gels, Dead Sea Mineral Mud and traditional Olive Oil Soaps, as were used by the Biblical Women of Valor. Experience the best Health and Beauty products made in the Biblical Land of Israel, with the worldwide known Dead Sea Minerals, Galilean Olive Oil, Jordan River Water and Jerusalem Soil and Soul. Upgrade your Skin, Health, Beauty and Soul with Bible Land Shop's Biblical Cosmetic collection.